Marking his first foray onto the Los Angeles dining scene at Baltaire, Travis Strickland has crafted a contemporary menu that redefines the traditional steakhouse. Upon graduating from the Culinary Institute of America, Strickland cooked at the legendary Blackberry Farm in Walland, TN, where he worked closely with products picked daily by hand, enabling him to foster an understanding of locally-grown food and how to build intriguing flavor profiles out of the purest ingredients. This skill, combined with his attention to quality, has informed the upscale, yet approachable menu at Baltaire. 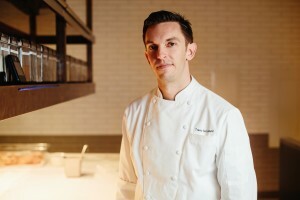 Prior to making the move to Los Angeles, the Midwest native worked in some of Chicago’s most recognized steakhouses, notably as the corporate Executive Chef for Chicago Cut Steakhouse and Executive Chef of its sister restaurant, The Local Chicago, for which he conceptualized and executed its successful launch in 2012. The bustling kitchen atmosphere ignited Strickland’s passion for working in steakhouses, while Chicago’s competitive restaurant market inspired his drive to further establish himself in the industry. Joining the Baltaire team has allowed him to subtly push the limits by creating a menu that showcases classic steakhouse cuisine balanced with global influences. “In developing the menu, my main priority was to strike a balance between elegant and approachable dishes our neighborhood guests and visitors would crave and enjoy every day,” says Strickland. Highlights include Prime dry-aged Cote de Boeuf or Porterhouse for two, new takes on iconic steakhouse sides like Roasted Mushrooms with miso butter, and lighter lunch options like a Lobster Cobb. While modern in approach, Travis revives certain time-honored traditions with Baltaire’s tableside service, featuring dishes such as sauteed Dover Sole, presented in a French copper pan, filleted and deboned in front of guests. Travis’ dynamic and engaging personality has led him to chef demonstrations on local and national TV shows such as KTTV’s Fox 11 “Good Day L.A.,” KCRW’s “Good Food,” and Hallmark Channel’s “Home & Family.” Additionally, since opening in March 2015, the restaurant has been praised by local and national media outlets like Angeleno, Los Angeles Confidential, The Hollywood Reporter, Los Angeles Times, AFAR, USA Today, and The Huffington Post, along with accolades for the “Best Steakhouses in Los Angeles” by Eater, WHERE, Haute Living, and Zagat, to name a few. When not in the kitchen, Travis enjoys staying active through running and cycling. He is very involved with Chefs Cycle and participates in the annual Santa Rosa fundraiser for No Kid Hungry, alongside some of L.A.’s most esteemed chefs. He and his wife currently reside in Valley Village with their three dogs, and they are expecting their first child, a boy, in August.